But, depending on the brand, if it’s easy to perpetuate harm like unfair wages through drinking a cup of coffee, then the reverse also true. As Rebecca Scott says in this TED talk, you can become a superhero just by drinking a cup of coffee. Rachael Burchett, the executive director of Solea Water, recently visited the community of Cotin in Haiti. Click here to read more about the process and how Solea Water brought life-giving clean water to the community! So, in repairing this one hand pump in Duval 22, our small actions could be contained in just a few hours. But the impact that this had on the people, the neighborhood? It ripples out until we can’t see it anymore. The learning opportunities at Solea are as diverse as the water projects and the opportunity to add ideas and perspectives to every facet of the organization has left me feeling both deeply connected to the organization and the people we are serving. Between March 18 - 22, 2015 nearly 500 people in multiple communities were provided with a way to drink clean water for the first time. Solea Water worked with All Saints Parish Mission Team to provide 60 families and several schools with Sawyer bucket filters. 3/18: Arrived in Belize City at 1 pm. After negotiating with customs officers, we agreed upon a "reasonable" duty for the water filters. We stopped in Belmopan, the capitol city of Belize, for provisions, linner (lunch+dinner), and the 60 five-gallon buckets that we had ordered from Javier. Finally at around 8pm we arrived at Tranquility Lodge. After enjoying refreshments with Lodge owners/great friends Lee and Suzy and company we returned to our rooms for a much- needed good night's sleep. 3/19: We stopped to say hello to Shantell and Juio and the students at Corazon Creek school. Next, we drove to Mabil ha to see if that village had bucket water filter systems. Our friends Candelaria, Concepcione, and Ruda were doing laundry in a creek near the road. We asked them to hop in the van, drove them home, set up water filter systems in their homes, tested the water at their village water pump, and finally drove them back to the creek. We stopped to visit Santiago and Margartia, who have a bucket filter system that has not been working. Rachael replaced the filter and reminded them to backwash it more often. We had a little time to visit with the students in San Lucas and their teachers/our friends Phillip and Romana. Then, as promised, families came to the church at noon. We provided thirty bucket filters for the school and homes in San Lucas! Roy drilled holes in the buckets for the hose fittings and Rachael explained how to assemble and maintain the bucket filter systems. We all had a hand in helping with assembly and collected $5 BZ from each family, which we donated back to their at the end of the workshop. After dinner, we had planned to prepare the buckets for the visit to Machakil ha. Within seconds Lee, Rick, Lester and Ingrid joined us to drill and file holes and remove the edging from the lids. With their help, we had thirty buckets ready and loaded in less then 30 minutes! It's a beautiful thing when Midwesterners, Belizeans, and Canadians join forces to help others! 3/20: After picking up Manuel in Otoxha, we drove to Dolores to load up the horses for our ride. Our guides bagged stacks of 30 buckets and lids and then strapped them to a disgruntled horse. We had heard that the trail was passable during the dry season, but I think most Americans would disagree. Marcos and the other guides had to coax the horses through hilly, horse-belly deep mud, over fallen trees, and over extremely narrow wooden bridges. Without stirrups, we just had to hold on with our legs and hope for the best! The teacher, Mr. Rash, had to abandon his dirt bike in the mud about ten minutes into the ride. We strapped the 50 lb suitcase of hygiene care bags to the back of Rachael's horse. Mine already carried assembled buckets and filters on each hip. Roy had a large duffle bag in his lap. Poor horses! The 6+ KM ride lead us Machakilha where we waited for men from each household to join us in the village's church for a bucket filter purification system workshop. We felt like a well-oiled machine just two days in. Roy provided most of the step-by-step instructions while Rachael and I chimed in helping students requiring further assistance. Manuel translated and answered questions.The men seemed pleased with their handiwork and thanked us several times. After some water testing and a meeting with Guillermo, the village health worker, we were invited to Mr. Pukul's home for lunch with his family. Thomasa Pukul prepared eggs, stew beans and tortillas. Finally, we rode the horses back to Dolores, and drove Manuel home to Otoxha. 3/21: Today was both productive and enjoyable. After breakfast, we stopped by a coffee shop in Punta Gorda to meet with the Health Chair of the Toledo District. Health officials are well aware that many communities need lasting solutions to the water crisis and they are continually prioritizing future projects. Mr. Vernon said that the government of Belize would welcome any assistance provided by Solea Water. A mission group from Colorado had scheduled a sports day at San Francisco De Jeronimo school in Pueblo Viejo. I didn't think that we'd get a chance to see any of our little friends, but they were all at the school when we arrived. Mr. Sho, the principal, invited us to have lunch at his home. It was nice to see his wife Marta again and meet their newest addition, two-month-old Stephen Jr. We discussed possible solutions to the village's water crisis and how our mission team might begin to address solutions when we return in June. Rachael measured elevations for a possible well and tested water from the pump from which the children were drinking. A small crowd of curious kids gathered around to watch and ask questions, giving Rachael an opportunity to remind them of the importance of drinking clean water. Joshua was intrigued by the water testing. I think we have found our future "Community Water Committee"! After meeting with Mr. Sho again to discuss his many ideas for improving the school and community, we returned to the lodge. Marcelia and Nestor Assi invited some of our close friends to their home for dinner. Nestor had asked Marcelia to prepare a very special caldo dinner for Mr. Roy. It was so nice to catch up with, Nestor, Marcelia, Dorla, Shantell, Romana and Oscar. 3/22: Francis and Elliot arrived at 7am to take us to the airport. I really don't mind the four hour drive to Belize City rolling through the scenic Maya Mountains dotted with thatch homes and hillside crops of bananas, corn and oranges. It's nice to kick back and reflect on the success of another unforgettable trip to Belize. January 6th--An anonymous donor matched my donations for 12 days and today, donated $500 to my campaign! There is no stopping me now. January 11th--My mom and I walked four miles together over winter break, because that is the average distance people walk to get clean water. She got to see how difficult it is to have to carry a jerry can filled with water. January 12th--I ran into my friend who is fundraising for my water campaign. Go Kelsey! She told me that have many people have come up to ask her why she is carrying a yellow jug and that she has gotten a lot of support. January 16th--I had a conundrum today after work: I thought I was going to be able to drive home, but found out I would have to bike. This meant that I would not be able to carry my jerry can with me, which made me really sad. But have no fear! The man at Mike's Bikes in Central West End told me not to worry. He provided me with a bike tire tube, which he strapped around my jerry can and backpack. Now, I will be able to carry my jerry can with me everywhere I go-even when I am biking. Needless to say, I am super pumped to bike now. January 20th--My friend, Kendra, took a jerry can home with her over winter break and went hiking with it. Her dedication is very admirable and I am so proud of her! January 23rd--Solea Water just received three more jerry cans, which means three more people can fundraise for my campaign now! January 28th--I have been getting a lot more people to sign up to carry a jerry can. Hannah is a student ambassador and she took her jerry can with her while she was giving a tour. She is a rockstar supporter of my water campaign! February 2nd--These two are very compassionate about my water project and I am grateful to have them involved! Kara and Sophie are both walking a half marathon with me in April with jerry cans. February 9th--I am overwhelmed with joy to say that over $2,100 was raised today by St. Francis of Assisi School for my clean water campaign. Now, I am nearly $1,000 away from my goal of purchasing a windmill aqueduct for Solea Water to provide a village with clean water. This water campaign journey has been the biggest blessing in my life and I am very glad my old school could help with not only fundraising, but spreading awareness about the water crisis. The students carried around cups to see what it felt like to have something with them at all times, just like I carry my jerry can everywhere I go and just like the many woman and children do who have to walk to get clean water. February 10th-- I REACHED MY GOAL of $7,500 to purchase a windmill aqueduct for Solea Water!!!!!!!! 5 months and 5 days ago I started carrying a jerry can to spread awareness about the water crisis. Little did I know that this yellow container would change my life. I have found a passion for something that drives me to be my best self and something I want to dedicate the rest of my life to. During this journey, I have felt the love from so many friends, family members, and strangers. I could not have done it without you all. I hope that my experience can encourage others to take small steps to make big change. All I did was carry a jerry can to class one day. And now, a village in Panama is going to have clean water because of it. Don't let anyone tell you that you can't. Because you can. I know you can! February 12th--I am very grateful for all of the water ambassadors who helped me to spread awareness about the water crisis and raise money to purchase a windmill aqueduct. I could not have done it without you! Walking 4 miles a day to retrieve fresh drinking water is a notion that is difficult to grasp if you are only reading about it. When you experience carrying 5 gallons of water 4 miles, it creates a much deeper impression. There are communities in Panama who don’t have access to clean drinking water and to get access in their villages is an expensive endeavor. My good friend, Hannah Vestal, is committed to raising $7,500 to purchase a windmill aqueduct for Solea’s Water for Panama. I recently took part in her Billiken for Clean Water campaign. I had an opportunity to help with the campaign while changing my life in the process. Hannah inspired me through her motivation and desire to take on such an extensive project. Her strong commitment is most evident through her “Jerry Carry” effort. I would see her day after day carrying her yellow jerry jug around with her everywhere she went, and I just knew I wanted to help out. I started by personally donating, but that wasn’t enough for me. Since I am a college student, I really could not give as much as I wanted. I talked to Hannah about getting involved in the “Jerry Carry,” and volunteered to carry the jerry jug at home over our winter break. I did not realize carrying a jug around with me would draw so much attention and how much the task would impact me. The first and most obvious observation I made about carrying the jerry jug were the different looks people gave me. At first I was very uncomfortable with all the looks, but eventually I decided to use them to my advantage. It was an excellent conversation starter that, at the very least, brought about awareness to the campaign. I learned some people thought it was really neat, and some people were just confused about why I would carry the jug with me. I used both of the responses to motivate me to continue carrying the jerry jug. The people I ran into either applauded me for the advocacy effort or told me I should be careful because the jug had “fuel” embossed on the side. I learned to label the jug a little better after that. The priest at my local church was one of the people who started asking me about the campaign and truly appreciated my efforts. He was generous enough to donate $20 to the campaign! I soon learned money was only a small part of the campaign. My family took a trip up to Door County, Wisconsin for a few days, and I was really excited to take the jerry jug with me hiking through the woods! I ended up walking 6 miles with the jerry and finally understood what many people endure everyday to find clean drinking water for their families. After the hike, I felt like there was no stopping me now... at least that was until airport security. I had such a wonderful experience over break carrying the jerry to Starbucks, Target, church, and on hikes. Even while waiting in the airport the campaign continued as my friend’s dad donated $20 to the jug. Then came airport security. I had very little trouble on the way home, besides a little joking from the flight attendant about the jug, so I figured this time would be a similar outcome.. I put the jug on the conveyer belt and the security officer started asking me questions about the jug. He was not very receptive to the campaign. At first I thought he was joking with me, but soon realized he was serious with his negative comments, and it really put me in a somber mood. Eventually, I boarded the plane and was finding a place for the jug, when Pamela started asking me about the jug. Pamela was a flight attendant, so I figured I would get a similar response like I received from the security officer in the airport. However, Pamela’s response was not the same by any means. I started sharing my story and information about the campaign, and she was very interested. She then proceeded to tell my friend, Kelsey, and me about a neighbor from back home who gave money to build wells in Africa. We all had a nice talk about how much we can all do to help. She even said she felt bad because she “Drank too much water today.” She then came back with $10 of her own money to add to the jug! I was so so happy. Pamela mentioned asking the pilots if she could walk up and down the aisle with the jug. Even though they said,” No,” because of policy, I was still so delighted with the effort Pamela had made. When we were about to land, Pamela came to where I was sitting and asked for the jug. She took the jug and went to the front of the plane. Then, her voice came over the loudspeaker and announced to the whole plane that I was working on this campaign, and she encouraged everyone to donate to the jug as they exited the plane. I couldn’t believe it! Pamela was going above and beyond to help out. As people exited the plane, I stood by the jug and watched person after person donate to the jug. The pilots even gave me money! The people of Southwest Flight 3311 collected $60 that day to help Solea’s Water for Panama campaign. To say I was happy would be an understatement. Pamela’s kind words and actions reminded me that small acts of kindness go a long way. As I handed over my jug to the next person willing to take on the “Jerry Carry,” I smiled to myself remembering my wonderful experience. Everyone deserves access to basic human rights, yet 783 million people in the world do not have the ability to get safe and clean water. This is roughly 1 in 9 of the world's population (The Water Project). Many people, women and girls especially, bear the burden of walking miles at a time to gather water from ponds and streams that are full of water-born diseases that is making them and their families sick. This is robbing communities of their future (The Water Project). I want to "walk" with the people who have to carry water jugs by carrying my own water jug all day every day. My goal is to raise $7,500, which will go towards purchasing a windmill aqueduct for Water For Panama. This is a community level water system that both filters and purifies the water. How does it work? A centrally located windmill and water tank is constructed and pipelines carry clean water to tap stands between the residents homes. Then, the people do not have to carry water jugs like mine to get water! September 5th—Today was my first day of many caring a water jug to classes. It has been a very humbling experience so far. September 23rd—This morning, I had no motivation to carry the water jug to my classes. I walk a lot slower with it and my arms get sore. But then I thought of all of the people who do not get a choice. They HAVE to carry a water jug every day because they do not have access to clean water where they live. September 26th—It was a true blessing last night to surpass my goal of $500 for my campaign for clean water. But then I stopped and asked myself, "where to from here?" I prayed to God about it and the answer was clear: keep going. I am making a new goal for myself of raising $1000. September 26th—Day 1 of taking my jerry can with me ALL day has been a success so far. We got in a good workout together. October 10th—Guys, we did it! $1,000 was made as of last night for Water For Panama. I cannot thank my fellow Billikens, friends, and family enough for their support in my campaign to help end the water crisis. I cannot end now, though, because 1 in 9 people in the world are still struggling to obtain clean water and they need our help! I want to be able to purchase a windmill aqueduct system for my friend Rachael, so this brings me to my new goal…$7,500!!! 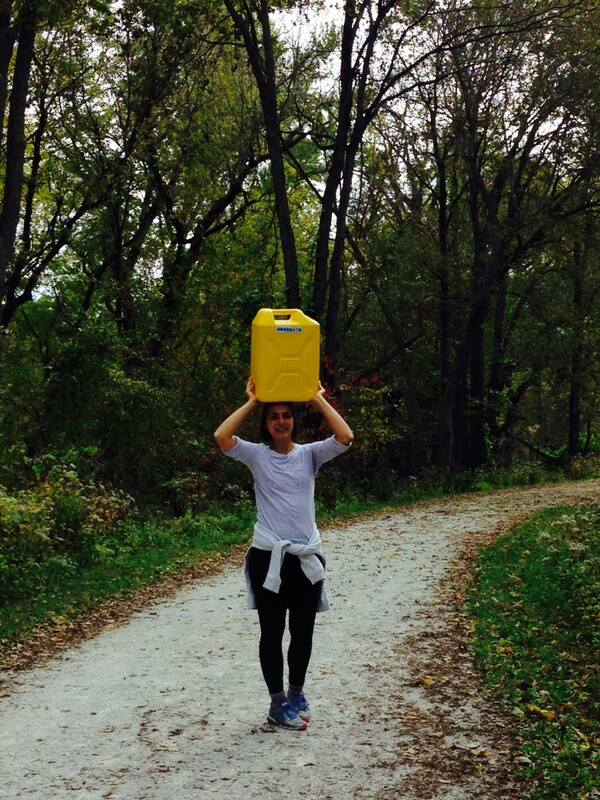 October 20th—Today, I walked four miles with my water jug. This is the average distance a person walks to get clean water. I cannot imagine having to do this every day. I was definitely sore by the time I was done. This makes me even more determined to buy the windmill aqueduct for Water For Panama. 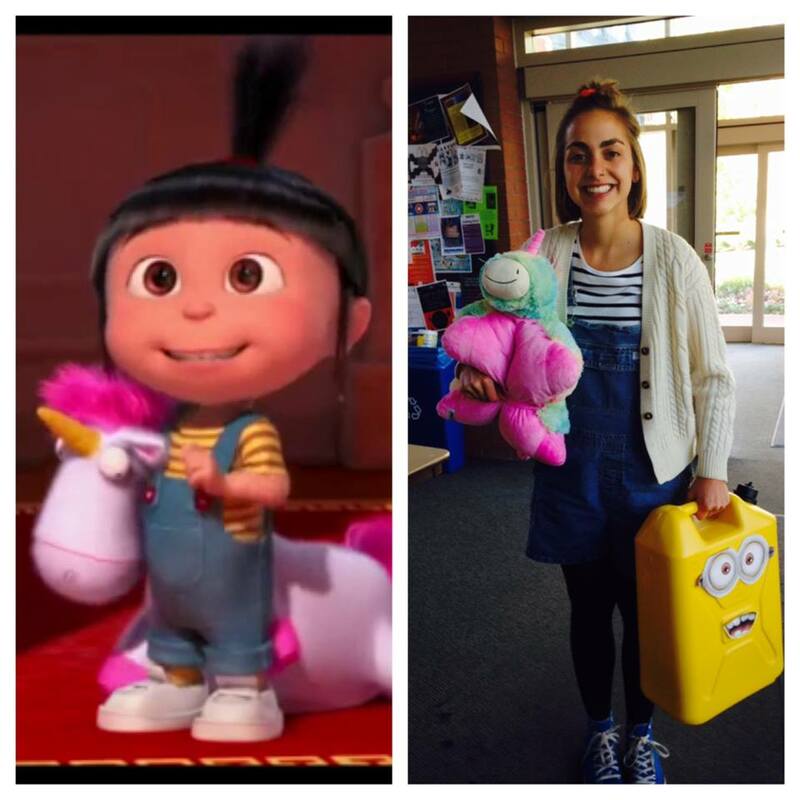 October 31st—I got to spread awareness about the water crisis dressed as my favorite character from Despicable Me. I think my water jug enjoyed being a minion for a day. November 15th—One of my heroes, Fr. 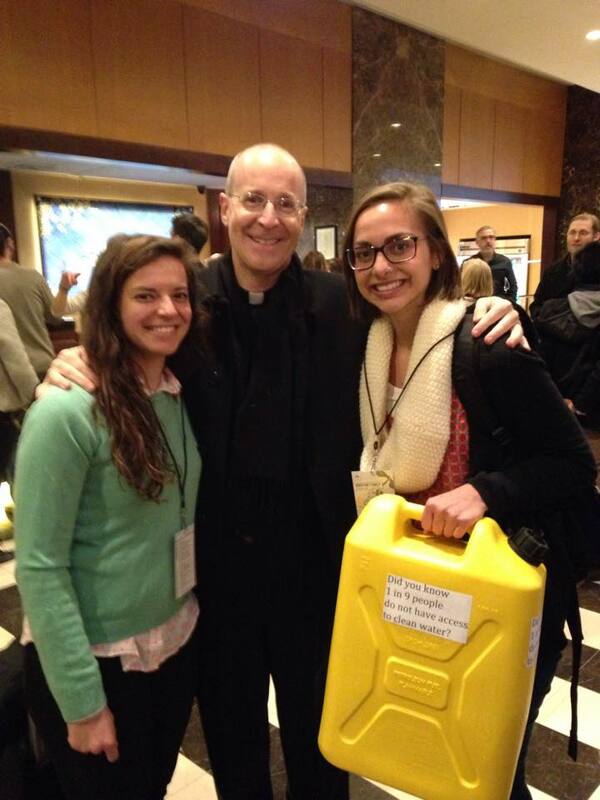 James Martin, SJ, supporting my water campaign. November 24th—My friend George decided to carry one of my jerry cans to help me spread awareness about the water crisis! For my second water walk, I walked down Pearl Street in Boulder, CO. Pearl Street is a lively place with blocks of shops, restaurants and street entertainers. I went on a Saturday afternoon, so there were tons of tourists and locals out enjoying their summer day. I wore two signs around my neck and my parents held the others while Katie handed out flyers. Katie also painted my jerry can to make me stand out even more! This was a great success. People were answering the question on my sign and would applaud me as I walked by. Although I didn’t raise much money from this particular walk, I still feel like I made a difference. The first step of changing the world for the better is to spread awareness and put a scenario into someone’s head. Visually showing Americans what women all over the world have to do just to receive clean water is much more effective than just talking about the issue. The walk was still very challenging, physically, and became even more of a challenge when people would walk slowly. If I wasn’t moving fast the water would begin to slosh around, causing me to lose my balance. The irony that was going on around me was amazing. All the consumption of food and people blowing money on expensive materialistic items, while the reality is people in our world can’t even afford water. It was heartbreaking, but at the same time gave me motivation to make a change. I completed another mile leaving me with a total of 2.7 miles completed. I felt much more accomplished after this walk because of all the awareness that I spread. My third walk was just around the block in my neighborhood, since I only had .9 mi left and I was getting ready to leave for school. Although not many people saw me, for those who did I am sure I left an image in their heads. This walk was extremely hard because the weather was so hot. I can’t even imagine having to walk everyday in heat worse than what it was in Denver. We are all guilty of having selfish habits, such as spending large amounts of money on something that we will probably just waste in a short period of time. Most likely we won’t even recycle it. Unfortunately, this is the culture we live in. Rather than changing your lifestyle completely, just try to be more aware about what you are doing. Open your eyes to what others are doing to help people. Find a way that you can sustainably make a difference in someone else’s life. We are never going to be in a perfect world, so we should at least focus on important factors of our future such as providing access to clean water to people around the world, which will then help women and children around the world receive an education, have a career, and enlighten our future. I completed my very first walk carrying about thirty pounds of water in my jerry can at Washington Park in Denver! I ended up walking 1.5 miles. Before doing this walk, people had asked me if I had tested or tried carrying the jerry can and every time I said no. This was because I did not want to train for it because I wanted the full experience of what it would be like for me to walk for water never having done it in my life. The only previous training I had was I started weight lifting this summer. My walking entourage included me carrying the water, my dad keeping track of the distance and helping me put the water on my head or shoulder, my friend Katie taking pictures and videos to capture the moment and my mom who had flyers to hand out to the public. When we first arrived at Washington Park, the jerry can was full, which was five gallons equivalents to 40 pounds. My dad helped me place the jerry can on my head and when I tried to take a step my arms started shaking and I felt like I was going to fall to the ground. I was frustrated because I knew it was too heavy for me to carry and I hadn’t considered how the water sloshing in the jerry would affect my balance. It really hurt my arms more than my back, which was a surprise. Walking faster made it a whole lot easier to keep my balance and minimized the water sloshing around in the can. I had to take breaks every .1-.2 of a mile. The level of concentration I had to use to walk was much higher than I expected. As I continued to walk, my arms began to fatigue but I could feel the rest of the muscles in my body working to keep walking. I was very frustrated with the frequency of breaks that I had to take. By the time I needed to take a break I would be breathing heavily and my muscles would be extremely sore. I originally thought that I would be able to walk and talk to people, but I had to concentrate hard on pushing myself to walk with the water. I had to keep in mind that the women who do walk with water everyday have been doing it their whole lives and that this was my first time. As I thought of the women walking for water, I gained more motivation. Rather than taking breaks every .1 of a mile I made it my goal to walk further. I was motivated by thinking about the fact that I go to a gym and on a machine to exercise, while women everyday around the world have to strain their muscles, backs and necks just to receive a necessity of life. I tried to picture my life having to get water everyday and missing out on my education. Then I would picture the fact that I can just go to a faucet and receive water whenever I want. And how my “first world” problems really aren’t problems at all. I used the frustration that I had thinking about the uneven distribution of water in our world. I thought about how we waste water by watering our already green lawns or taking a two- hour shower just because we had a “rough” day. I thought about how even places that suffer from water scarcity physically, such as the United Arab Emirates, still use so much water everyday for, in my opinion, unnecessary reasons. Another interesting part about my walk, was that no one questioned what I was doing. People definitely stared, but no one cared to ask what I was doing. Only one person did. Of course it could have just looked like I was doing an intense work out and people were embarrassed to ask, which I understand. I did wear my Water for Panama t-shirt that said “Ask Me About Clean Water” but no one did. This was disappointing because I was hoping to spread more awareness about the issue. To solve this problem I will bring signs and my lovely friend Katie is painting my jerry can. The objective of this first walk was for the personal experience of walking with water so I can now talk the talk about the issue because I have personally given it a shot. Of course, not to the extent that people around the world have, but I can now better talk about what it must be like to carry water every day and why everyone should have access to clean water. The objective of my second walk will be to spread the word about the issue. I am so glad that I am receiving this opportunity and support to share what I am passionate about and be able to walk the walk to talk the talk. Thanks to everyone who read this and please see my fundraising page for to give more support. Together we can save the world, one glass of water at a time!